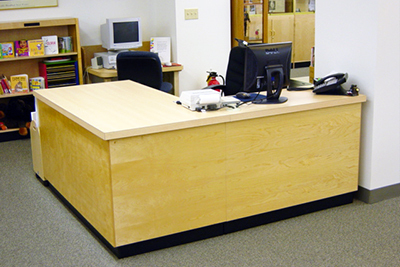 Office Desks can be made as sectionals. Also used as computer or audio-visual station. No. 6030 Office Desk Desk -top is 1 1/2" thick, 30" deep, 60" long, 29" high, center drawer 4" H x 24" D x 24" W with pencil tray, 2 slide shelves 15" W x 24"L, bottom left drawer 13 3/4" H x 15" W x 24" Land has file follower. All other drawers 6 1/2'' H x 15" W x 24" L. All drawers have drawer rollers for smooth operation. No. 7230 - OFFICE DESK - (Not shown), same but 72" long. No. 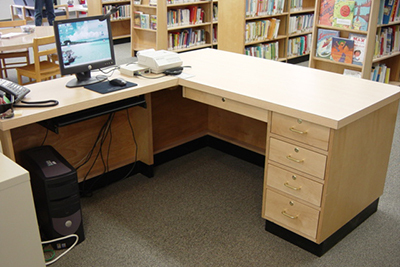 7228 - CHARGING DESK - 7174" long, 28" wide, 32Yi'' high. I Yi'' thick. plastic laminate top and band. Right sid e-one drawer with three crosswise trays for 3 x 5 cards. Left side-one drawer with two cross­wise trays for 5 x 3 cards. Adjustable shelves. All drawers have drawer rollers for smooth operation. No. DF-2 - FILE CABINET - 2 drawer 27 'h" H x 16" w x 24" D.
No. DF-3 - FILE CABINET - 3 drawer, 39 W' H x 16" W x 24" D.
No. DF-4 - FILE CABINET - 4 drawer, 52" H x 16" W x 24" D.
All drawers have full extension drawer rollers. 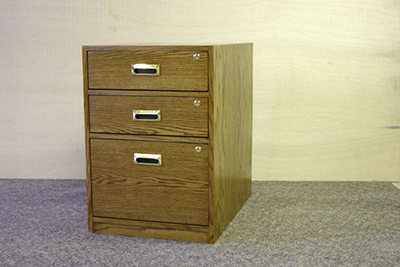 Legal size drawers are available - total width is changed to 19".